New HYDEX® 4101 UD Blue ultra detectable PBT from Ensinger, Inc., offers food equipment designers the flexibility of an engineering polymer that is visible to food conveyor line optical, x-ray, and metal detection systems. HYDEX 4101 UD Blue offers the ability to address all three of these methods of quality control with one product, while maintaining the improved physical property and chemical resistance profile inherent to polyester based engineering plastics. Engineers designing parts for food processing equipment will find particular success in applications in which parts are subjected to cleaning chemicals that are chlorine or caustic based cleaners. 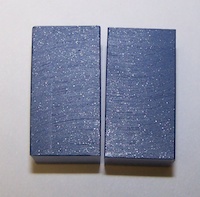 HYDEX 4101 UD Blue also offers the benefit of good wear resistance and toughness. Typical applications are: food processing pump impellors, filler valve parts, and food forming plates. HYDEX 4101 UD Blue is available in both rod and plate stock.